Many lists detailing the highest-paid business executives and self-made billionaires disproportionately feature men. 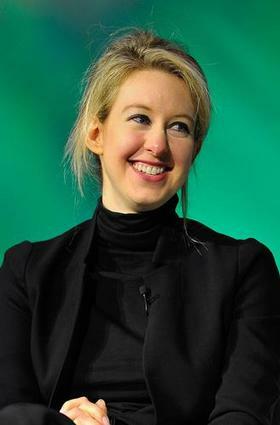 However, 30-year-old Elizabeth Holmes has disrupted those lists with her title as the youngest female billionaire in the world. At the age of 19, Elizabeth Holmes dropped out of her chemical engineering program at Stanford University and used the tuition money her parents had saved for her to pursue a business aspiration in healthcare. She felt strongly that her tuition money could be used for a greater cause than staying in school and when she first told her chemical engineering professor, Channing Robertson, what she planned to do, he was initially concerned that she was making a terrible mistake. After convincing the professor of her inventive idea and receiving his blessing, Holmes started her own company, Theranos. The young Holmes wanted to create a technology that would make blood tests easier. The idea stemmed from her hate for needles and wanting to make the tests simpler, cheaper and more assessable to all. For the past decade, Holmes worked quietly on a technology that would make blood tests nothing more than a painless finger prick. The current way we receive a blood test is from the 1960s and is archaic, expensive, painful and slow. After the 11 years mostly working in secret, Holmes’ company is now valued at $9 billion and is changing people’s lives. Now one drop of blood can run 30 lab tests with results in less than four hours, according to the company. The results are also faster, more accurate and much cheaper than conventional methods. This will allow people to know much more about their own health and fast. The technology is astounding, and will change healthcare as we know it. After pursuing a mission to shape the future of lab testing, Holmes has not only improved a sector of the healthcare industry and touched lives, she has made history because of her net worth. Reportedly, Holmes is now worth $4.5 billion.